Punch Pizza was in the process of getting their web site built when they came across a blog post by local pizza blogger Aaron Landry that was mildly critical of Punch for prohibiting him from taking a photograph of their pizza oven, as was wren at Flickr. Landry’s post led them to Flickr and they realized that many people were posting they’d taken at Punch Pizza locations and the quality of those photos were striking. On Facebook, they found a Punch Pizza fan club. If your product or service is great, then your customers are likely to fans as well. Punch has great food and as the Flickr photos and Facebook fan club illustrate, they have fans. 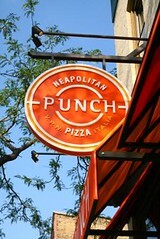 This social media activity inspired Punch to create the Punch Neapolitan Pizza "Capture Our Fire" Flickr photo contest. Though they had legitimate business reasons to keep people from taking pictures of their ovens, Punch Pizza eliminated the no-photos policy. As Landry’s blog post and the photos of Punch at Flickr made clear, their customers were also fans. If they wanted to take photos, the potential of someone stealing trade secrets was outweighed by making their customers happy. They are giving away $3000 worth of Punch Pizza dining cards to the winners and they’ll use the contest entries for their new web site when it launches. That will certainly make customers very happy. We helped punch Punch navigate the social media waters by building the infrastructure through which they could learn a new way of communicating with their customers. Punch Pizza co-owner John Puckett wanted to let Aaron Landry know that they’d changed their photo policy and were launching the contest, so he emailed Aaron and invited him to take part in the contest. With that, the contest was launched.